When it comes to finding the best things to do in Banff in summer, an adventure of any kind is quite literally on your doorstep. From gondola rides to canyon walks and boat tours, it’s hard to know what to do first and how to make the most of your vacation aside from visiting the busy attractions. Here are some of the top ways to explore Banff National Park. Perfect to warm-up your legs before a CMH Summer Adventure, or stretching them after a trip to the lodge. Be prepared: This includes packing bear spray (and knowing how to use it), bringing enough layers for any type of weather, having adequate water and food, and always doing your research about any restrictions such as mandatory group size and forecasts. Read our post about What to Pack. Perfect for acclimatizing to the altitude. Located right in Banff, this short hike packs a visual punch and even allows you to finish the day at a craft brewery. The route consists of moderate switchbacks to the top of the small summit while offering glimpses of the town below between the trees. Once at the top, you’ll enjoy an exceptional view of Banff as well as behind the mountain looking over the Bow River and the Fairmont Banff Springs Golf Course. On your return journey, you can continue the walk right onto Banff Avenue and perhaps a leisurely stop at Park Distillery or the Banff Ave. Brewing Company. Views and cake; what more could you ask for? An incredibly popular hike in Banff National Park – and for good reason. The trailhead starts on the shoreline of the famous Lake Louise. You’ll climb steady and moderate switchbacks through dense pines, which offer much needed shade on warm summer days. The hue of the cobalt blue glacial water only grows in intensity the higher you climb, and you’ll marvel at the flashes of colour of the lake between the trees as you ascend. Close to the top, you’ll spot a waterfall. Climb the wooden staircase, and you’ll find a historic mountain cabin set on the side of the small but beautiful Lake Agnes. It serves tea, cakes and treats to weary hikers. Take cash with you. You can choose to either walk back the same way you came or extend your day to the Plain of Six Glaciers Teahouse. Not only does this hike take you to some of the most impressive views in Banff National Park, but it begins at a location that was once featured on the Canadian five dollar bill. Moraine Lake is world-famous for its vivid blue colour and striking backdrop of ten peaks surrounding the water; this is where your day starts. From here, you’ll join the trail just along the shoreline, and walk the pine-lined switchbacks as you make your way to Larch Valley. Once there, you’ll plateau into rolling terrain through a stunning meadow. As the name suggests, the area is full of Larch trees as well as small alpine lakes. If you want to push yourself a little further, continue to follow the path towards the back where you’ll ascend to a pass. Traversing over loose rock, follow it to the top and breathe-in the 360 views of the outstanding landscape. Take to the water in the most Canadian way possible with one of the best things to do in Banff in Summer – canoeing! The Banff Canoe Club is walking distance from downtown, and it’s the perfect way to discover some of the rivers and lakes closest to Banff. Embark on an upstream paddle on the Bow River as you take in the sights of the towering mountains around you. Or, you can navigate through the serene waterways towards Vermilion Lakes, where you can paddle freely on the open water. Keep your eyes open for wildlife! Canoe and kayak rentals are $45 per boat for the first hour and $24 for every additional hour. Alternatively, you can rent a Stand-Up Paddle Board (SUP) from the same place and they’re $30 per hour. Full-Day rental is also available for $125 meaning you can take the SUP to one of the other local spots such as Two Jack or Johnson Lake. Both are incredible locations to soak in the views and are a 10-minute drive via car from the town of Banff. Local’s tip: You may find the temperature of Johnson Lake better for swimming (or taking an unplanned dip if you’re just starting out on a SUP). There’s also a pleasant short, easy walk if you want to stretch your legs after your time on (or in) the water. If you’re looking for mountain biking in the town of Banff, there are 200km of trails at your disposal. From rugged single-lane tracks to family-friendly rides that will keep the kids happy; it’s definitely about quality vs. quantity. A good place for beginners is the Spray River Loop. Totaling 11km, the winding loop starts and ends at either the Fairmont Banff Springs hotel or the Bow Falls Parking Lot. Perfect for a family ride. For those who are more experienced, head to the Bow Falls Hoodoo Trail for a challenging singletrack route that’s guaranteed to have you feeling the burn during its 4.3km length. Check out Banff Lake Louise Tourism’s complete list of trails. Whether you need to warm-up to a CMH High Flying Adventure or if you want to keep the fun going after a trip, the via ferrata at Mt. Norquay is an excellent summer activity in Banff. There are four routes, qualified guides who will lead you, and a Cliffhouse Bistro to finish your day. Even if you don’t feel like climbing, you’re welcome to ride the scenic chairlift to the Bistro to soak in the big views from the top. Sun, scenery, and an opportunity to sink a few balls. The Fairmont Banff Springs is home to the prestigious Stanley Thompson Golf Course. Set within all-encompassing views, the course is both captivating and challenging. The 18 holes total 6,938 yards in length, course par is 71, and the experience is priceless. If you don’t feel like going for the full 18, head to the Tunnel Mountain Course for 9 holes across 3,287 yards, and you’re rewarded with the same views. Finish your game on the deck of Stanley’s Smokehouse Restaurant while overlooking the fairway with a cold drink. 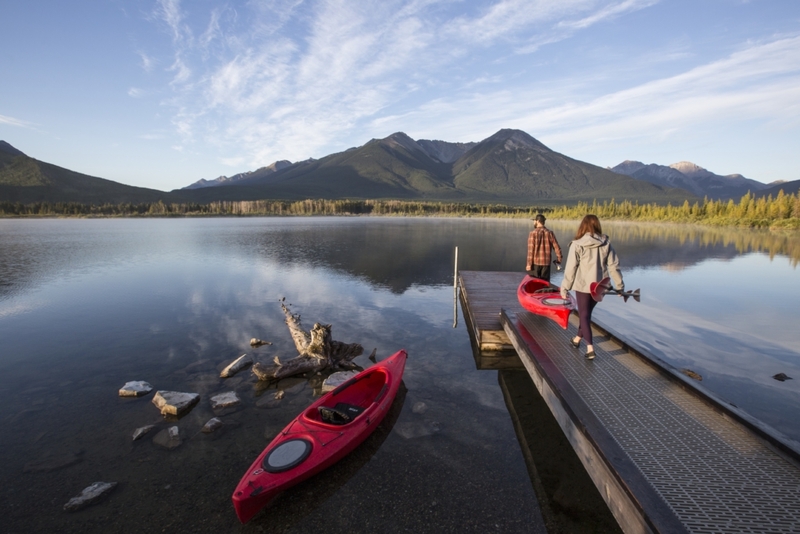 For more ideas on things to do in Banff in summer before or after your CMH Summer Adventure, get in touch with our Vacation Planner, or take a look at the Banff Lake Louise Tourism website.